“I admire its purity,” Ian Holm said of the Xenomorph terrorising the crew of the Nostromo in Ridley Scott's Alien. The clockwork simplicity of Scott's seminal 1979 film remains a thing of beauty, but it is a quality that has eluded the subsequent entries in this series. Three sequels found increasingly convoluted ways to reunite Sigourney Weaver's Ripley with her alien nemesis, and having exhausted that particular strand, 20th Century Fox has tasked Scott with taking us back in the other direction. Prometheus and now Alien: Covenant promise to fill in the backstory behind Alien, despite the fact that nobody ever asked for such elaboration and that nothing in Alien is made better by being explained. Alien: Covenant certainly gives us cause for concern in its opening scene, in which we witness the creation of David (Michael Fassbender), the duplicitous android who became the central figure in Prometheus. That film struggled to move under the weight of its ambitious themes, and Alien: Covenant begins with David and his creator discussing creation. “If you created me, who created you?” David asks Dr. Weyland (Guy Pearce), and he quickly comes to a telling conclusion. “You seek your creator. I am looking at mine,” he says. “You will die. I will not.” Who needs these flawed humans anyway? After this prologue, Alien: Covenant settles into a more familiar Alien movie; a little too familiar perhaps. The narrative is largely a rehash of previous installments, with the crew of the Covenant (a talented and mostly under-utilised ensemble) being drawn to an uncharted planet when they intercept a stray transmission. Having verified that this planet is inhabitable, they touch down for a closer look, which is just the first of their fatal misjudgements. Alien: Covenant delivers its most thrilling set-piece shortly afterwards; a sequence beginning with microscopic spores entering some poor soul's ear and resulting in an ominous pain in the chest. The escalating panic and horror of this unfolding nightmare is brilliantly orchestrated by Scott, and throughout the film he is at his best when building a creeping sense of suspense before the aliens appear; it's just a shame much of that suspense dissipates when the creatures do make an appearance. They are fully CGI creations now, and they look it. The presence and tactility of the monsters made by Carlo Rambaldi and Stan Winston has been replaced by something that looks too slick and weightless to convincingly share the frame with the actors. An interlude following this dramatic encounter indicates where Scott's real interest lies, though. There's no doubt that he could stage a perfectly fine and effective horror in the lineage of the film he made almost forty years ago, but instead he turns it into The Island of Dr. Fassbender, with Prometheus' David making his return. He has been playing with alien biolgy in the decade since we last saw him and he has developed a serious God complex, which puts him at odds with the happily servile Walter, the Covenant's android, also played by Fassbender. “Better to reign in Hell than serve in Heaven,” he tells Walter, and the shading that Fassbender brings to each of his performances, skilfully playing off himself, makes this section of the film remarkably compelling. 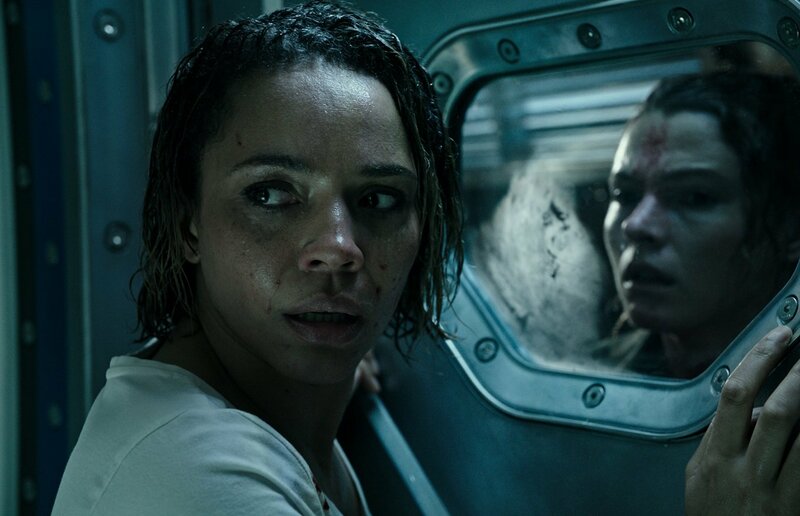 Even though these encounters are between two synthetic characters, they feel grounded and human in a way that Katherine Waterston dangling from a wire as she chases an alien across the top of a spaceship does not. Such is the conflict at the heart of Alien: Covenant. It feels torn between delivering high-end blockbuster spectacle and posing ambitious questions, and in the end it is only a partial success on both counts. The climactic action sequence is particularly rote and unsatisfying, but Alien: Covenant still manages to end on a strong note with a final twist that – even if the reveal is slightly bungled – manages to achieve a chilling effect. It also proves beyond all doubt that this is David's franchise now. The aliens feel like an afterthought.